The Saltire Awards have been designed recognise the commitment and contribution of youth volunteering to voluntary organisations. Brandon, a fantastic volunteer in our Dumfries shop is taking part, and the awards are helping him to record the skills, experience and learning he has gained. I started volunteering with Age Scotland in Dumfries after I left school and I didn’t want to sit about doing nothing. It has helped me gain skills which will be useful in a paid job. This includes working as a member of a team, taking instruction from managers and customer service amongst many others. I have learned that being reliable is important. I really enjoy coming into the shop because I get on well with everyone and I like the atmosphere. This is why I am happy to have done 500 hours volunteering. Since Brandon started with us in September he has really come out of his shell and gained a lot of new skills. He has become a key member of the team – he can be relied upon and work unsupervised. 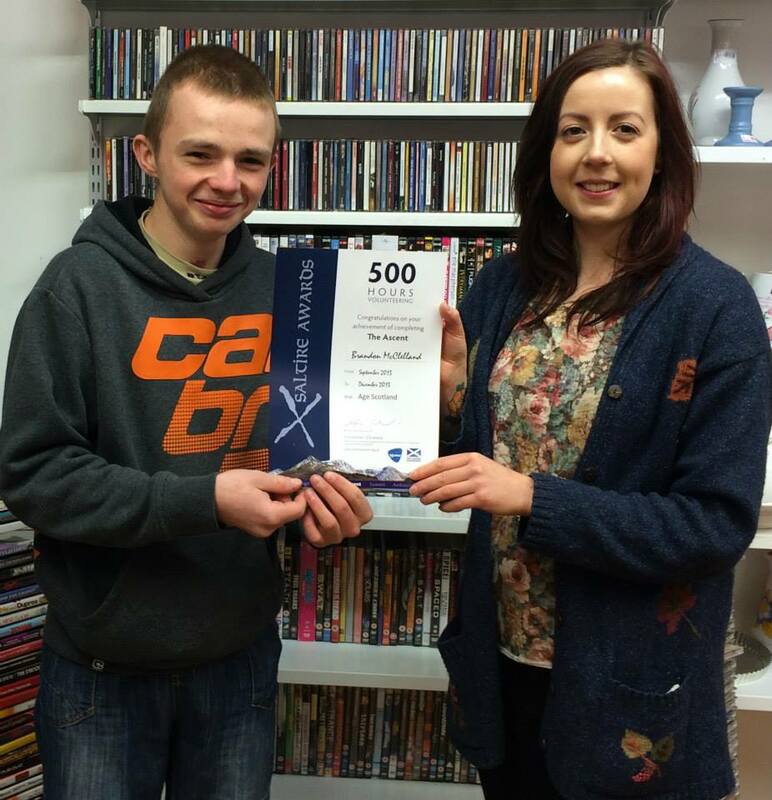 I’m really proud to see the development of his skills in such a short space of time and it’s great to see his contribution recognised by the 500 hour Saltire Award. We enjoy having him in the shop as he has a great sense of humour and his cheeky character amused staff, volunteers and customers alike!